All of the big winners in this year of 1953 were black-and-white films. The big winner was Fred Zinnemann's eight-Oscar winning From Here to Eternity (with thirteen nominations and eight awards including Best Picture, Best Supporting Actor and Actress, Best Director, Best Screenplay (Daniel Taradash), Best Cinematography (Burnett Guffey), Best Sound, and Best Film Editing). 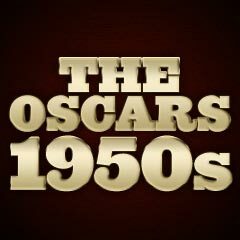 All five of its major actors and actresses were nominated, with secondary players Donna Reed and Frank Sinatra taking home the Oscars. 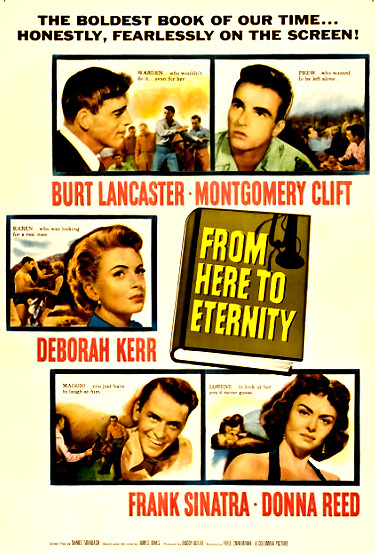 The candid film was based on James Jones' controversial, best-selling novel about Army life on an Hawaiian (Oahu) military base just prior to the Pearl Harbor attack and World War II, to illustrate the conflict between an individualistic private (Montgomery Clift) and rigid institutional authority (exemplified by the Army). Its achievement of eight awards matched the all-time record held by Gone With The Wind (1939). The record would be tied again the following year by Elia Kazan's On The Waterfront (1954). The competition in the Best Film category included director George Stevens' classic western about a retired gunslinger who helps a homesteading family - Shane (with six nominations and one win - Best Color Cinematography) - a film victimized by the Academy's anti-western bias. In an ironic twist, this year's Best Picture and Best Director victor Fred Zinnemann could commiserate with George Stevens, because of the prejudice his own western High Noon (1952) had received the previous year from the Academy. The film Titanic, the pre-cursor to the mega-blockbuster and award-winning Titanic (1997), came away with two nominations (Best Art Direction and Best Screenplay), and won the Oscar for the latter (for Charles Brackett, Walter Reisch, and Richard Breen). Walt Disney achieved a milestone in the 1954 awards ceremony - as the individual with the most Oscar wins (4) in a single year. He won the award in four awards categories: Best Cartoon Short Subject: Toot, Whistle, Plunk and Boom (1953), Best Documentary Short Subject: The Alaskan Eskimo (1953), Best Documentary Feature: The Living Desert (1953), and Best Two-Reel Short Subject: Bear Country (1953). Alan Ladd, portraying the title role as a shy drifter and gunslinger in Shane, probably his finest career performance, was not nominated as Best Actor, nor was Jean Arthur nominated as Marion Starrett, a homesteader's wife with a never-acknowledged love for Shane. Alongside nominee Marlon Brando should have been Shakespearean actor John Gielgud who played the role of Cassius in Julius Caesar. Many other potential Best Actress nominees were also ignored: Marilyn Monroe and Jane Russell in director Howard Hawks' un-nominated musical Gentlemen Prefer Blondes, Doris Day as the title character in Calamity Jane, and Gloria Grahame as gangster moll Debby Marsh whose face is disfigured by scalding hot coffee thrown by Lee Marvin in director Fritz Lang's violent, un-nominated film The Big Heat. Another Anthony Mann/James Stewart collaborative western The Naked Spur, probably their best, received only one nomination - for Best Original Screenplay.